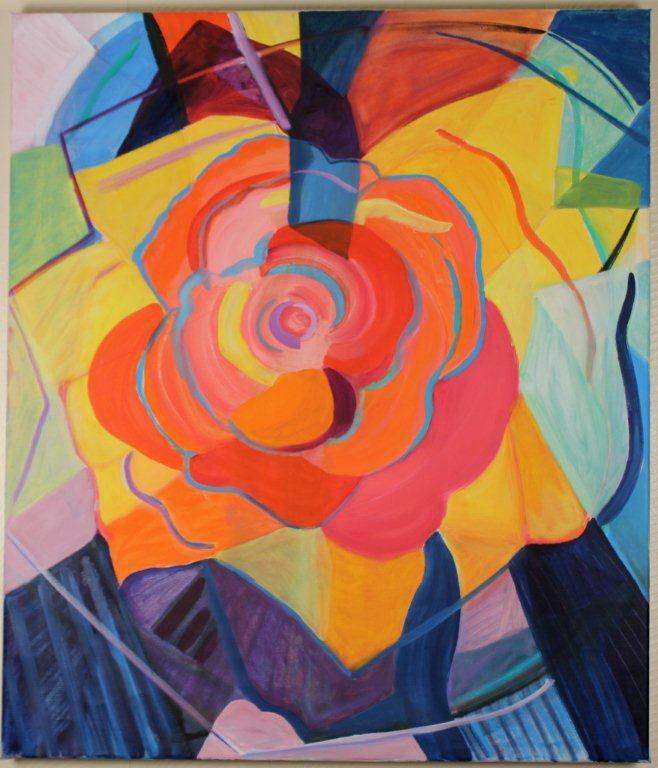 Gaithersburg presents an exhibit featuring oil and acrylic paintings by Arlette Jassel and Farzin Sadeghi at Kentlands Mansion from August 9 through October 4. The public is invited to an Artists’ Reception on Tuesday, August 13 from 7 to 8:30 p.m.
Maryland artist Arlette Jassel has shown internationally in a one-person museum exhibition in Kaliningrad, Russia and in the Arts in Embassies program. Her work is featured in many private collections. Jassel has taught art at Georgetown University School, The Smithsonian Institution, Marymount University, Montgomery College, and Montgomery County Public Schools. This exhibit features images of flowers that go through metamorphosis. Single blossoms painted in oil on canvas begin as intense flower shapes, then change as they struggle with shapes in the background. Petals lose their fragility, in the process becoming both stronger and more aggressive. Flowers become drones, robots and war machines as they withstand the pressures of life and abandon their passive role. Farzin Sadeghi, a naturalized Persian-American, is a painter, craftsman and builder, with an extensive past as an architect and engineer. He has been on a quest for many years to express eternal universal spiritual values through new artistic modes that reflect the insights of advanced scientific cosmology and philosophy but draw deeply from the thought and art of the past, especially the transcendental poetry and classic esthetic sensibility of his native Iran. This can be seen in his use of light and color as evocations of metaphysical transcendence. Convinced that “artists do best by addressing their era’s concerns,” Sadeghi seeks inspiration from not only modern art as a historic whole, but that of far earlier times. His paintings are basically abstract, technically almost ultramodern, yet display a playful bright color sensitivity reminiscent of Persian carpets. Kentlands Mansion Gallery is located at 320 Kent Square Road, Gaithersburg. Viewing is by appointment only. Please call the Mansion at 301.258.6425 to schedule a visit. I love the announcement. Can you also run one that includes a reception Sunday, September 22, 2013 from 1-3pm It is open to the public and free of charge.